Angelica's Signature Light Facial for super glow healthy skin. Advanced beauty therapy showcases state-of-the-art treatments expertly combined to give in depth skin rejuvenation. The Signature Light Facial packs a proper power punch leaving you fresh faced and glowing. An initial deep Hydra cleanse helps to remove keratin cells that block pores. A medium depth Radiance peel targets fine lines and irregular pigment deposits. Hyaluronic acid mask helps to re-establish a healthy epidermal barrier. Short bursts of light promote collagenesis and control rosacea. A soothing Manual lymph drainage massage completes the process leaving you incredibly relaxed. 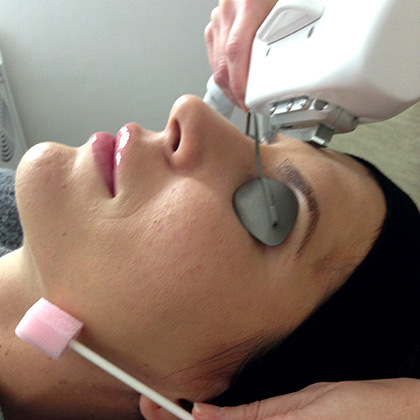 The Signature Light Facial is adapted to your specific skin needs following a consultation and RevealR skin imaging. SESSION: The Signature Light facial takes 60-90 minutes. COURSE: Suggest one session every 2 week. AFTERCARE: 'Good to glow' straight after your treatment. COST: £360 per session or book five and get the 6th free. Call 0207 486 9040 for more information or to book your initial treatment.